One of the best ways to learn about Lisbon and rediscover the city is by travelling aboard the nº28 Tram, which departs from Martim Moniz and Campo de Ourique (Prazeres Cemetery), and travals past some of the most charismatic districts of the Portuguese capital. 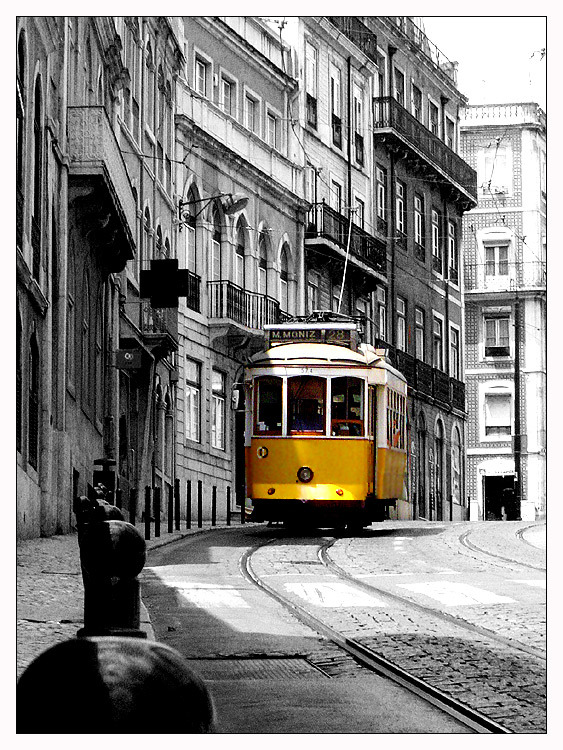 The historical neighbourhoods of Alfama and Graça and the most fashionable side of modern Lisboa reflected by Chiado and those of Estrela and Campo Ourique are part of the route of this already famous tram which runs daily rides through Lisbon in an authentic time travel. Throughout the trip it is well worth looking closely at the architecture of the buildings – the result of diverse influences – as well as the ceramic tiles – typically Portuguese art – that line the facades and Art Nouveau styles friezes. Tram nº28 is one of several trams originally imported from the United States in 1901 with the aim of replacing the old horse-drawn carriages, which were the main means of transport at the time. Its yellow painted exterior is unmistakable as well as its wood interior, transporting passengers to other eras. Aboard the nº28 Tram, visitors have the opportunity to explore the many facets of this “white city”, which blends, like no other European Capital, centuries of history with a modern lifestyle.